We are delighted to present the details for Full Deck ideal for a cottage holiday in Dartmouth, Devon. To book or find out more please use the Booking Info or Availability buttons below. A tastefully presented and well equipped two bedroom semi-detached house, featuring an outside courtyard area perfect for a barbecue and al fresco dining. Set in a quiet, predominantly residential area, Full Deck is a dog friendly property within just a short walk of Dartmouth's picturesque waterfront, boutiques, galleries and restaurants. When you book a holiday at Full Deck you also get access to an indoor pool. An indoor pool is perfect for a swim what ever weather Devon decides to produce on your holiday. Imagine being able to start your day of touring Devon with a refreshing swim in an indoor pool - bliss! There is wifi or internet access available at Full Deck in Dartmouth. Perfect for searching for things to do whilst on holiday, catching up on emails or even work if you have to. On nice days, when you want to relax you can sit out in Full Deck's garden and enjoy the sun shine. Children also love the outdoors so it can be a great place for them. Although, with young children you should always check any garden is safe for them. One of the key benefits of a self catering holiday is the ability to choose how you eat! Full Deck has a barbeque so you can, weather permitting, cook outside and enjoy a barbeque on a warm summers night whilst enjoying the fresh air. There is one or more televisions at Full Deck. Ideal if you want to catch up with the latest on your favourite programmes or just fancy a quiet night in relaxing in front of the box. Why waste part of your holiday doing the washing up. Full Deck has a dishwasher installed to save you time, and family arguements, about the washing up. Everybody hates doing the washing up and the last thing you need is a big family arguement about who is going to do the washing up while you are on holiday. Great news if you just want to get away for a long weekend or short break. Full Deck accepts bookings for short breaks. So if you fancy a few days in Devon to recharge your batteries then this cottage is well worth consideration. Full Deck sleeps up to 5 people so could be perfect for your family or group. So if you are looking for a family holiday in Devon then Full Deck could be just the ticket. If you have a dog and you want to bring them with you on your holiday in Devon then... Great news! Full Deck welcomes dogs. Often cottage owners have some restrictions on where your dog can roam in the property and there may be a small extra charge. However, there is no reason why your pet needs to miss out on the family holiday. LOCATION - Set in a quiet, predominantly residential area a couple of minutes walk from the town centre and River Dart. ENTRANCE - A shared entrance porch contains the front door to the property opening onto a small hallway with hanging space. Hallway leads to the - - SITTING ROOM/DINING AREA - Original wooden floor. Furniture comprises two sofas, coffee table, stove style gas fire, flatscreen TV with Blue Ray DVD player, CD player, plus MP3 player input. A dining table and four chairs occupy part of the room. Stairs to bedrooms and door leading to courtyard. KITCHEN - Door leads off sitting/dining area to modern kitchen with tiled floor. Well equipped with fridge/freezer, oven, hob with extractor over, microwave, dishwasher, washing machine and tumble dryer. Overlooks courtyard. BEDROOMS - Two good sized bedrooms, one with a king-size, one with twin beds. Both have a wardrobe and dressing table. Master bedroom has a flatscreen TV. *A Z-bed (for a child only) is available on request. N. B. Linen and towels (except those for the beach) are provided. BATHROOMS - Luxury bathroom with large free standing shower cubicle, separate bath washbasin w/c and heated towel rail. The property throughout has instant hot water. OUTSIDE - A courtyard area with gas barbeque, large table with parasol and chairs is situated off the sitting/dining area to the rear of the property. PARKING - **A parking pass is provided for the long stay car park. DART MARINA SPA MEMBERSHIP - Guests can enjoy the use of the luxury facilities of the Dart Marina Health Spa, including indoor pool, steam room, jacuzzi, gym and beautifully designed relaxation areas. Beauty treatments from Elemis can be pre-booked, with 10% off for those staying at Full Deck. Please check details with the office. OTHER INFORMATION - Full central heating tand constant hot water throughout. Children and pets welcome, but smoking is not permitted. Broadband available. As you can see Full Deck is located in a great location. The perfect base for any holiday around Dartmouth. And well suited to explore the whole of Devon. There are plenty of great places to vist near Full Deck. Take a look at out holiday ideas pages for details of many places that are well worth considering visiting whilst on holiday at Full Deck. 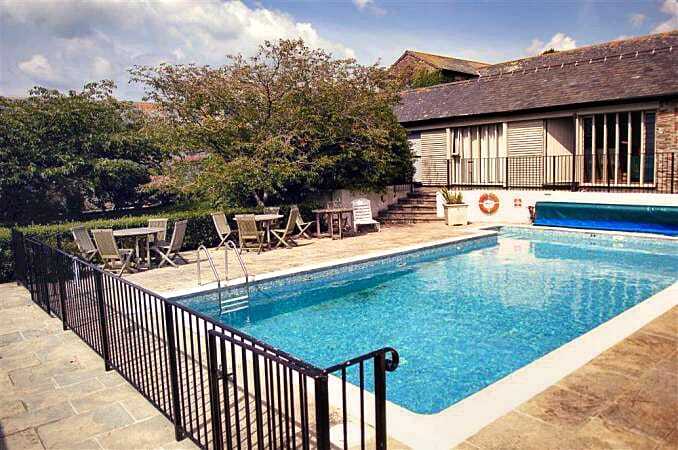 Tanglewood provides a relaxing atmosphere where guests can enjoy the beautiful views of this rural location and the lovely swimming pool. Built from beautiful natural stone, this barn conversion has been tastefully restored and lies close to Mothecombe and Plymouth.